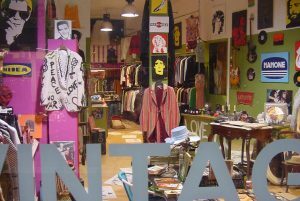 Barcelona is home to a great many vintage stores, mostly in the Ciutat Vella old town district, and a lot of which are situated in Carrer de Tallers, a street in the Raval neighbourhood. 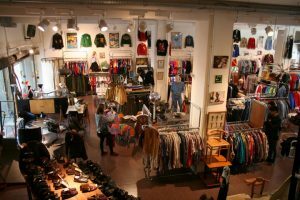 Here’s a selection of some of our favourite shops in Barcelona, ranging from the old to the new, from budget buys to vintage chic. 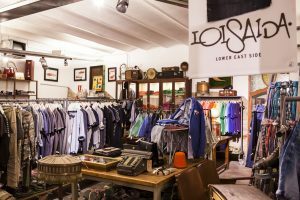 Loisaida is an eclectic mix of the old and the new, throwing together vintage home pieces and new retro-style clothing. Much of the clothing is unisex, but if you’re looking for something in particular I have no doubt you’ll be able to find it. 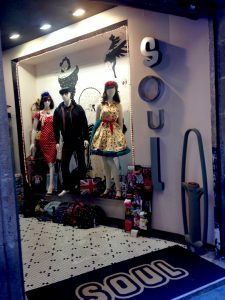 As one of the larger vintage shops in Barcelona, the store offers a whole range of items from jazz classics of the twentieth century to vintage telephones to second-hand jewellery. The aesthetic is clearly well thought through; as you enter the shop you’ll see kids’ beach shorts stuffed into pockets of a wall hanging, and as you explore further you’ll feel almost as if you’re walking into a dressing room of an estate home. Spend an hour here in the early evening and then cross the street for some live jazz at a New York-style restaurant called Little Italy for a full vintage experience. Located in the outskirts of the Gothic Quarter, Le Swing is most certainly a rare find in Barcelona. It sells only the highest quality vintage, ranging from Yves Saint Laurent and Christian Dior shoes for 70-90€ to Chanel dresses for around 300€. Prices at Le Swing do vary, but you should be able to buy a fashion steal for less than 30€. Though it’s only a few square feet, the shop manages to create a relaxed and friendly atmosphere, even if it is a little cosy! The music you’ll hear played through the speakers will often be indie covers of pop song and the staff are lovely, helpful, and speak English. I’ll certainly be returning to spend a full afternoon there, and may well pop along to Blow, its sister store on Carrer del Bonaire. 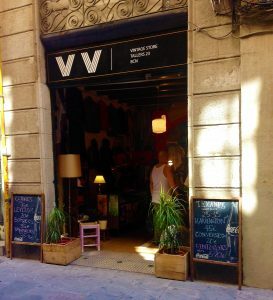 Also known simply as “vintage store”, this shop is one of the many vintage vendors on Carrer dels Tallers. Here you can find dungarees, spandex leggings, swimsuits, hippy felt coats, army uniforms, baseball sports vests, and many other standard vintage buys. They do not waste space here: there are chests packed with hats, braces, beach shorts, among other things sitting underneath and between clothes rails. A particular favourite of mine were the beach shorts with yellow smiley emoticons printed on them. Another gem of the Gothic Quarter, Flamingo’s Club is a combined bar and vintage kilo sale. It stocks all things bright, colourful, and exuberant, and everything at pretty reasonable prices! It has three categories of clothes: 7€/kg; 14€/kg; and 18€/ kg. Expect lots of Hawaiian shirts, an impressive 80s collection, pleated skirts, and a fair few pairs of Levi’s jeans. Their bar is situated at the back of the shop. It’s a great place to chill in the early evenings when it sells fresh juices and sushi, and to party later at night when they have DJs. The bar gets fairly crowded later on, so get there early and make the most of their happy hour that lasts until 10pm. If you’re looking for 50s-style rockabilly dresses, this is the place to go. Though Soul doesn’t sell any vintage, its clothes have a clear vintage influence. It’s general aesthetic is punk with a hint of goth and steampunk (at the rear of the shop you can find top hats and tail coats) and, of course, there is a lot of leather. This place also does some really cute retro sunglasses – all the great things about the vintage style, but new! 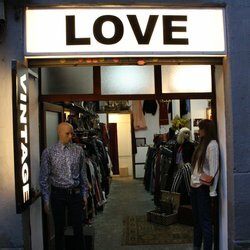 Love Vintage sells second-hand vintage and retro clothing for men and women. The shop’s style consists mainly of 80s and 90s streetwear and a lot of denim. You can probably shop here on a budget, unlike many places in Barcelona. Though it’s a small space, it manages to pack quite a few different things in: cute rucksacks, Mickey Mouse T-shirts, over-sized T-shirts and much more. As with many vintage stores, you can certainly expect an abundance of brightly-coloured T-shirts. Not to be confused with Flamingo’s Club on Carrer d’Avinyó, this is another vintage shop in the neighbourhood of El Raval. Each item is priced per kg and you’ll find that while in the entrance the clothes are from the 80s and 90s, they increase in age as you go further into the shop. Packed ceiling-high with clothes, this store stocks camouflage t-shirts, cheerleading outfits, baseball caps, flamenco outfits, cowboy boots, and much much more. It’s great for just looking around, whether that’s the vintage lingerie section or the rail of intensely sparkly clothes towards the back. The shop is pretty impressive, especially their stack of vintage Nikes. And if you still want more after this one, head over to Carrer dels Tallers for their twin store at No. 31. There you can buy tie-dye crop tops for 15€ and as many snap backs as you can handle. Vintage A5e stocks pre-loved clothes, accessories, and home ware from the beginning to the end of the twentieth century. The first thing you’ll notice will probably be the red flamenco dresses, but after that the most striking clothes are the leather jackets and fur coats. You can find all manner of things here, and the prices are reasonable, but not super cheap. Even if you go for nothing else, the amount of vinyl this place has will keep you occupied for several hours. It has pretty much every rock ‘n’ roll artist of the twentieth century, along with a number of other genres. Another shop with a twin on Carrer dels Tallers, Holala! is a blend of streetwear, retro, and vintage. It has a great vibe and you can always rely on their speakers to be blaring some kind of techno/electronic music. 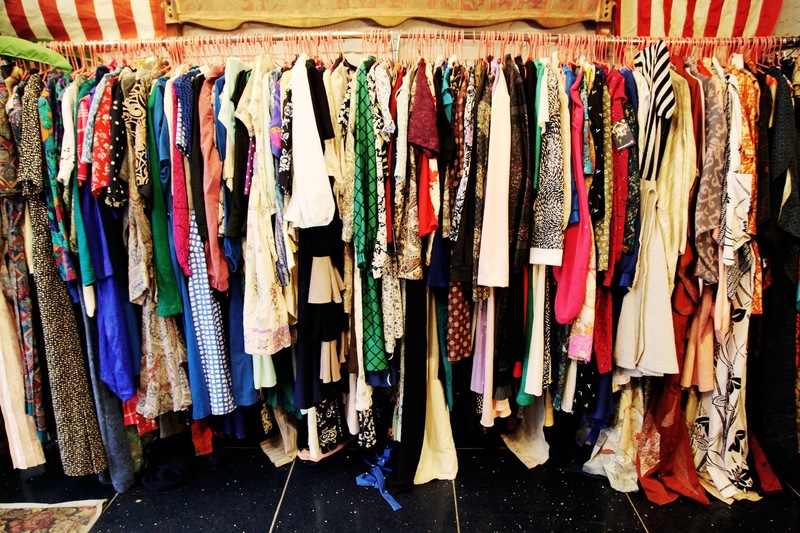 Here you can find retro sunglasses, tie-dye crop tops, Hawaiian shirts, and pleated mini skirts among many other things often sold in vintage stores. Head over to Tallers and you’ll see walls decorated with skateboards and Vans lining the stairs. Ultimately, the most entertaining part of my visit was seeing a rail of trousers from the 90s – the kind MC Hammer is famous for wearing. If nothing more, it’s a cool place to spend an afternoon. This should give you some idea as to wear you can buy vintage in Barcelona. Happy shopping!